China has been monitoring and censoring messages sent through the internet service Skype, researchers say. Citizen Lab, a Canadian research group, says it found a database containing thousands of politically sensitive words which had been blocked by China. The publically available database also displayed personal data on subscribers. Skype said it had always been open about the filtering of data by Chinese partners, but that it was concerned by breaches in the security of the site. Citizen Lab researchers, based at the University of Toronto, said they discovered a huge surveillance system which had picked up and stored messages sent through the online telephone and text messaging service. The database held more than 150,000 messages which included words such as "democracy" and "Tibet" and phrases relating to the banned spiritual movement, Falun Gong. "These text messages, along with millions of records containing personal information, are stored on insecure publicly accessible web servers," said Citizen Lab's report, entitled "Breaching Trust". They said that by using one username, it was possible to identify all the people who had sent messages to or received them from the original user. 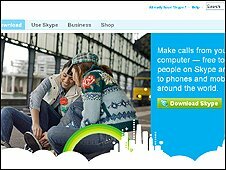 Skype is operated in China as Tom-Skype, a joint venture involving the American auction site, eBay and Chinese company TOM-Online. Citizen Lab said it was "clear" that Tom was "engaging in extensive surveillance with seemingly little regard for the security and privacy of Skype users". They asked to what extent Tom Online and Skype were co-operating with the Chinese government in monitoring communications. But Skype president Josh Silverman said China's monitoring was "common knowledge" and that Tom Online, had "established procedures to meet local laws and regulations". "These regulations include the requirement to monitor and block instant messages containing certain words deemed offensive by the Chinese authorities," he said. Mr Silverman said that it had been Tom Online's policy to block certain messages and then delete them and he would be investigating why the policy had changed to allow the company to upload and store those messages. Although internet use is high in China, the authorities have long prevented citizens from accessing websites which are considered politically sensitive. Western internet companies such as Google, Microsoft and Yahoo have been criticised by human-rights groups for adhering to China's strict regulations.